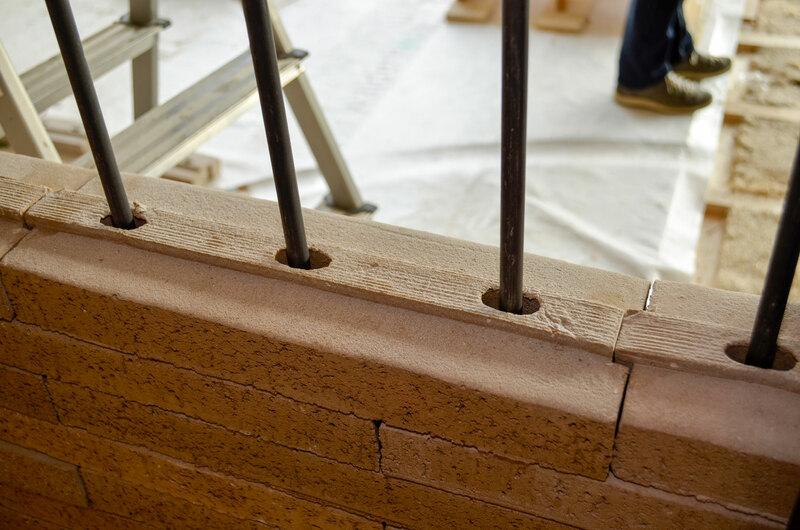 The mortar-free brick wall in the UMAR unit challenges the material as well as the construction of a typical load-bearing wall. The stones produced especially for UMAR have holes and are simply threaded onto steel rods from above. They can also be wedged into each other by a tongue and groove system and are thereby activated as a wall plate. The system now makes it easy to change the bricks by pulling them back up and reusing them in other places. Also the metal rods can be reused or recycled. The stones are produced by the company StoneCycling, a young startup from Amsterdam, which returns mineral rubble back into the technical cycle. This waste group is one of the largest in volume and difficult in terms of circular building – StoneCycling starts here. In addition, the products offer a high aesthetic value, as the history of the stone remains visible. UMAR uses the product „nougat“ in various processing conditions, the brown levels being former bricks. The company also offers stones such as „wasabi“ or „salami“, depending on the starting material. In salami, for example, the white inclusions are obtained from old ceramics (sinks).